Newsletter Plus Software is a PHP application that contains everything you need to start Email marketing. Featuring a built-in campaign editor you can create visually stunning newsletters, promotional emails and flyers. With our intuitive Drag-and-Drop Newsletter Editor and absolutely zero HTML skills you’ll soon be emailing newsletters that look professional and breathtakingly beautiful. Easily adjust style of almost every design element on the email. Unlimited number of subscribers and mailing lists, subscription and unsubscription forms management, import and export options, bounce handling, extended statistics for each newsletter and subscribers activity and much more. Easy installation from your web browser, painless integration into any website. Free installation and life-time support come with this newsletter application. Ability to send emails punctually might need you in many situations. For example, you want to congratulate someone on the landmark date. Funky and fun? Elegant? Classy? Serious? Informative? Technical? With our intuitive Drag-and-Drop Newsletter Editor and absolutely zero HTML skills you’ll soon be emailing newsletters that look professional and breathtakingly beautiful. Want to edit your Email campaigns via old way? We left in a classic Newsletter Plus Software Wysiwyg-editor. You can activate it if you want. 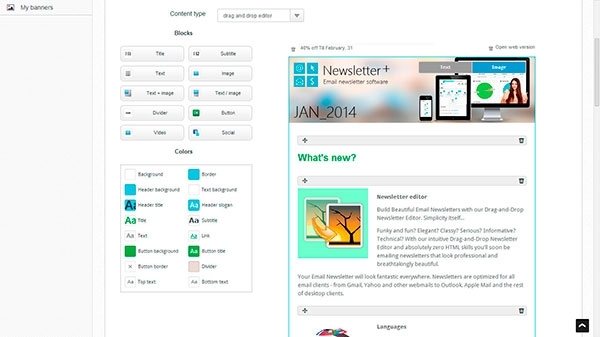 Edit your own HTML, change the text, fonts, styles, insert personalization tags and more. Already have your newsletter made by designer or need custom design? Import your HTML with a single click and we'll automatically inline your CSS and host your images. Now you can make it personal. Why not insert your subscribers name or email address? Pretty cool stuff. Triggers automate your mailing lists management adding subscribers to a different mailing list when they open a specific email or sending subscribers a certain newsletter when a particular link is clicked etc. Want to make your letters more unique? You can use the text randomizer in the subject, text and from name fields. Create hundreds or even thousands of mailing lists and either import your existing subscribers or use our newsletter script to automatically create a subscription form for your web site. Import from CSN, XLS has also. 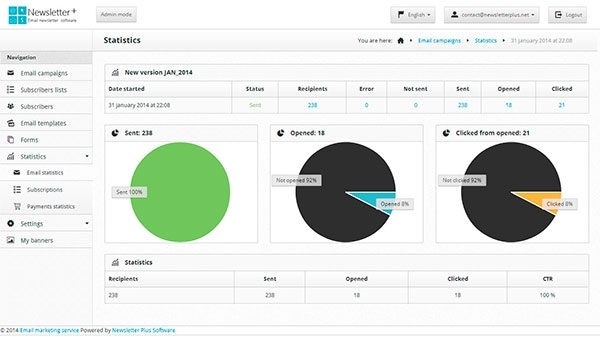 Newsletter Plus Software allows you to easily create subscription and unsubscription forms to be used on your site. All you will have to do is to put the html code of the form which will be generated by the newsletter script. Statistics on newsletters that you send informing on the number of clicks, opens, unsubscriptions etc. Having this valuable information will help you to determine your contacts' interests, how your list is growing, and much more! You can use several ways to send Email messages: mail, sendmail and smtp. You can specify multiple SMTP servers and adjust the quota for each shipment. Also for each SMTP server you can specify a mailbox and password to read Bounced messages. We've added to Newsletter Plus Software solution for send your letters via API of popular services: Amazon SES, Mandrill, Sendgrid. Additional Info: Multiple servers license lets you have an unlimited number of sites associated with fixed number of servers. The sites may be located on this servers only. Additional Info: Multiple sites license lets you have an unlimited number of sites associated with one server only. License cost does not depend on the number of sites. Additional Info: 1 site license lets you have 1 site associated with one server only. Additional Info: You can test Newsletter Plus Software for Free! 14 days.